Obviously, therapy is more complex, but this is to give you an overview of my approach and one of the many tools I use in my therapy sessions. Mom is requesting services for her 6-year-old daughter. The 6-year-old is the middle of three daughters. Mom and Dad got divorced about two years ago and the girls see their dad one time during the week and stay at his home every other weekend. At the first session, the client presented as somewhat disheveled with her hair out of place, food on her face, etc. Mom presented as a great parent, however, did show some signs of anxiety. Mom described that she and Dad communicate well as co-parents. Dad came into session the following week and he presented as a great parent as well, however, described more issues in their co-parenting relationship than Mom did. 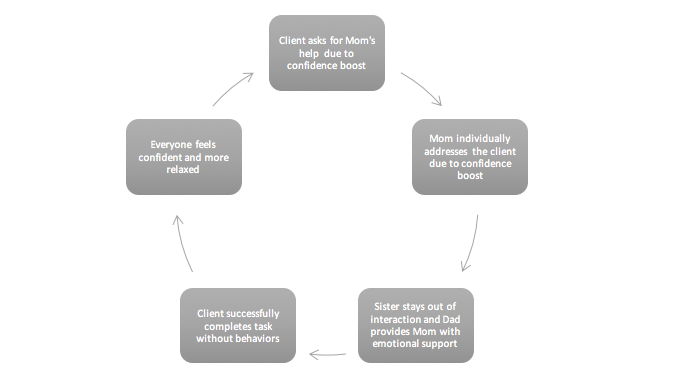 The client would often show up to session and described her feelings as related to her family members; if Mom said she was feeling anxious, the client would as well. 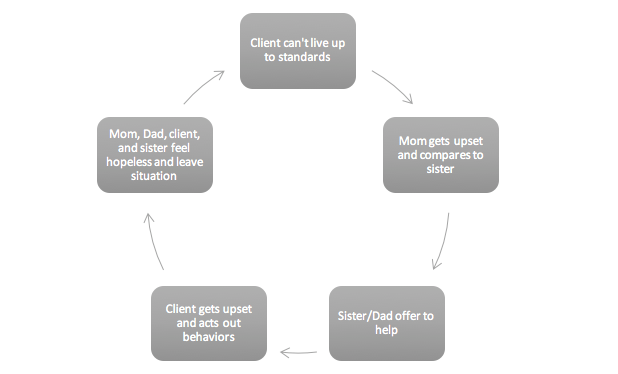 As a therapist, in order to enact change within a family (also known as a system), I look for patterns of behavior. Often times they are subtle but they play out in nearly every interaction between family members. Coming up with a core negative interactional pattern (CNIP) is one way to delineate where specific change can happen for results. From this CNIP, I can help the family address the feelings associated with each particular section. By address the feelings, a level of understanding will follow which ultimately will inspire behavioral changes. It is important to note that at any point in the pattern any person of the family can change their negative behaviors. The goal is to take the existing pattern, address specific behaviors and emotions, and change the pattern through family sessions. I can address the nuances that add fuel to pattern continuing and I can do this by creating conversations, having the family play a game together, and many other ways to instigate the pattern. I will help flesh out the root of the issues within your family so that you will leave my office, go home, and recognize yourself that your pattern is starting to play out. This is one of the many tools I use to help families and individuals move forward with their lives.